You've got to hand it to bands/artists/whoever for not getting stuck in a rut of producing the same thing over and over again, and I think that's something I worried about for Youth Club when I first heard them a couple of years ago after the release of their second EP, Brothers. Between then and now, Youth Club have released three tracks that, whilst staying true to themselves as what I'd call a tropical infused indie-pop band, sound miles apart from their first two EPs. The quartet also appear to have put out a Christmas single that completely passed me by. It's possible that this maybe just didn't make it on to stores in time for the festive period so nobody ever mentioned it? I've no idea, but it exists if that's something you fancy in mid-February. The reason we are (read: I am) gathered here today is, however, for the band's new single 'Are You Wanting It All'. It's a slow burner for sure but it's probably the most sophisticated sounding track Youth Club have put out thus far. 'Are You Wanting It All' genuinely sounds (in the least contrived and purposeful way) as though it was made for radio; not that their other tracks weren't, because all of Youth Club's songs are radio friendly, but this really feels like "the one", you know? I also can not believe how straight out of the 80's the pre-chorus of "You take all of my time, you take over my mind" is - that's some straight up George Michael stuff right there. 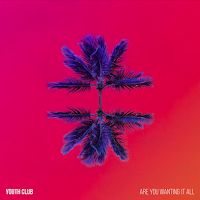 Youth Club are playing a single release show for 'Are You Wanting It All' on Wednesday (22nd Feb) at Camden Barfly (read: Camden Assembly, but we all know it's really the Barfly) for a mere £6.